Posted on July 7, 2016 at 12:40 pm. Are you mad for fishing? Know your tuna from your marlin? Microgaming has created the pokies game for you, where you can combine your love for fishing with your love for the slots in this bold, vibrant game set against a glimmering ocean backdrop. After somewhat menial releases from Microgaming lately, like Pretty Kitty and Ninja Magic, Reel Spinner is one of the better titles. While it doesn’t contain particularly innovative features or highly animated symbols, there’s enough good stuff in there to make Reel Spinner a solid game choice and is well worth a try, for fishing buffs and everyone else. Reel Spinner is a five reel, three row, 15 payline video pokies game with a jackpot of up to 112,500 coins. Symbols are made up of all kinds of fishing paraphernalia like rods, boats and compasses, along with five different kinds of fish in an array of colours. Wild symbol – the Reel Spinner wild substitutes all other symbols to form a winning combination, allowing for wins of up to 1,500 coins. Free spins – three or more of the scatter symbols triggers a special free spins bonus, where you get to pick from one of six boats to reveal your number of free spins. Once you’ve been issued with your free spins, you get to spin the fishing reel to reveal your free spin multiplier, with all wins during free spins multiplier by this amount. There’s a maximum of 20 free spins with a 4X multiplier up for grabs. 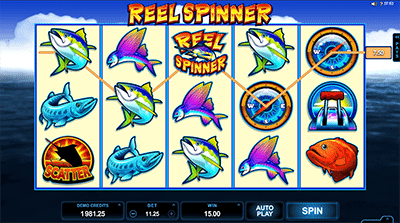 Play Reel Spinner today to see if you can hook, line and sinker your way to some big wins! Sign up to play Reel Spinner at Royal Vegas Casino and claim up to $1200 in new player welcome bonuses.